Why does schizophrenia flare up in families? The answers are mostly biological. Schizophrenia is a disease rooted in human biology—and as heritable as human height, as it turns out—so who better to guide that discussion than a biologist whose own brother struggled? Ronald Chase, a professor emeritus of biology at McGill University, gravitated toward biology seeking to fathom the fundamental nature of the lifelong schizophrenia that developed in his older brother Jim in college. Chase narrates the family’s tale as a brother and biologist in alternating chapters of Schizophrenia: A Brother Finds Answers in Biological Science, an accessible read that crosses the gulf between scientist and ordinary family member. The personal side of the story, which takes place over fifty years, makes an indelible impression. If intellectually-gifted older brother Jim never recovers from his onset at UCLA, then the younger brother Ronald makes his life count for something special in the mission of biological discovery he goes on. 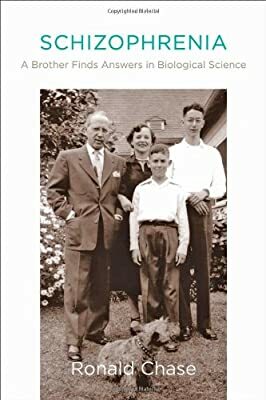 What Dr. Chase produces is a rare combination of family memoir and accessible explanation of the neuroscience, genetics, and the epidemiology of schizophrenia. I simply love this book.